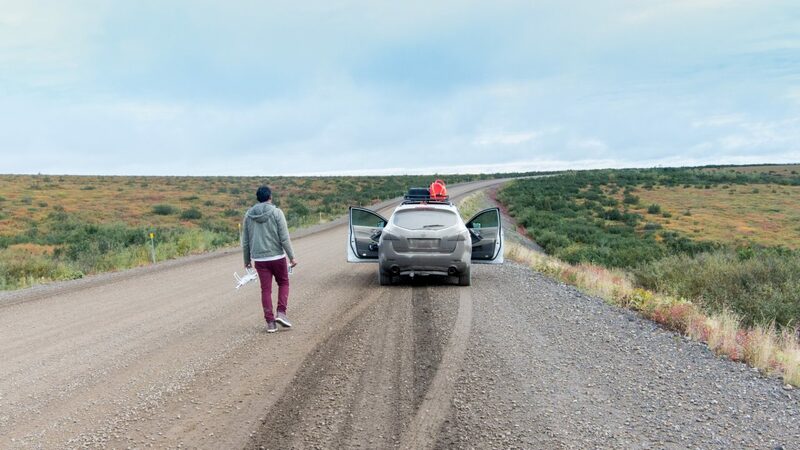 Its the only way to reach Arctic ocean by road in North America on your own vehicle. And Yes, we made it with our Nimo!!! 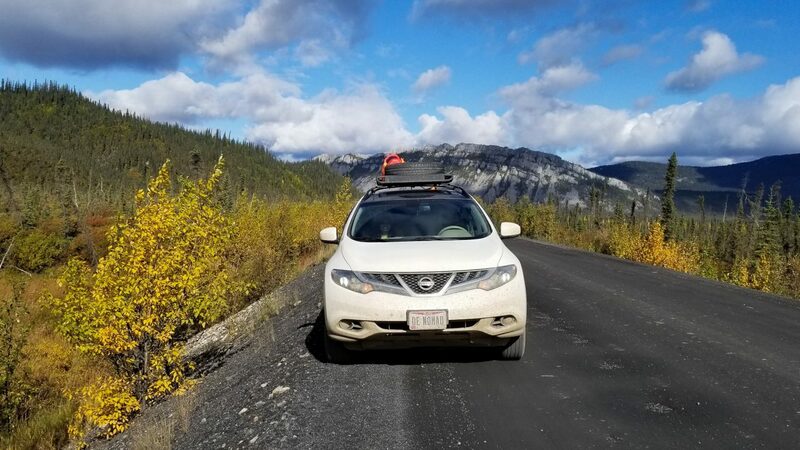 Last year (Aug 2017), we drove the famous Dalton highway up until Prudhoe Bay, Alaska. Apparently, the only way to touch the Arctic Ocean is to take a paid tour. 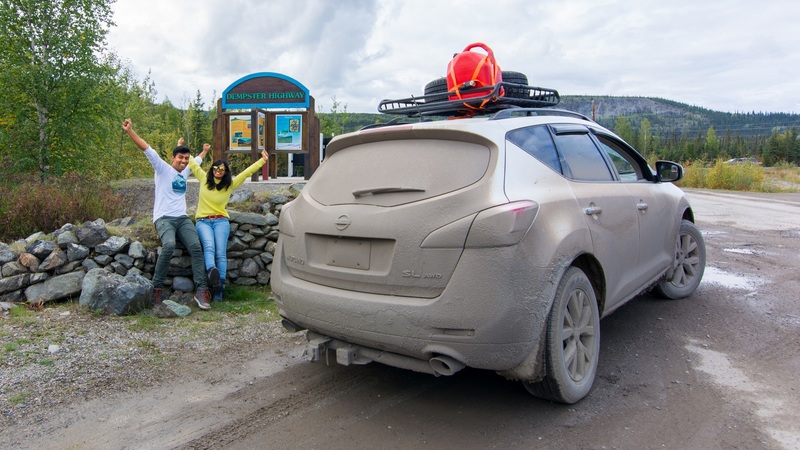 After driving 5000 miles, there was no way to drive to the Arctic Ocean on our own car! 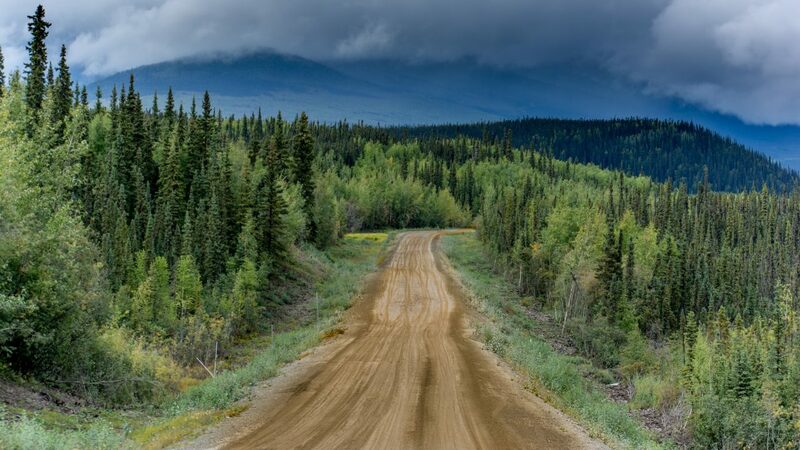 That is, until November 2017 when an all-season highway was opened between Inuvik to Tuk in Canada. 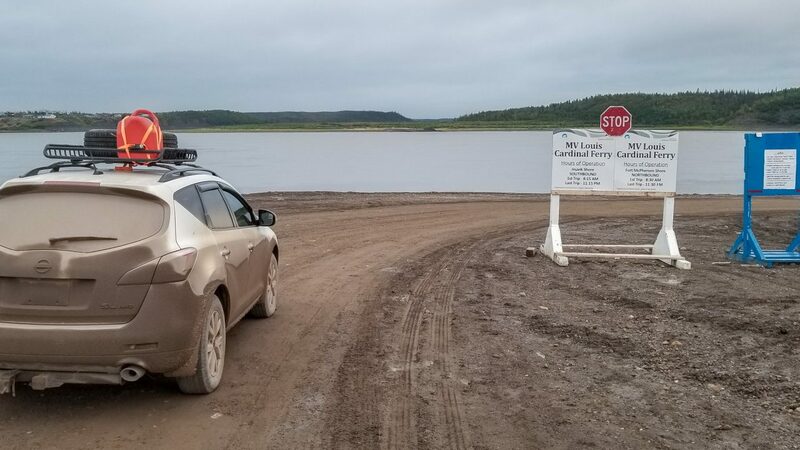 Till then, the highway ended at Inuvik and the only way anyone could reach Tuk was during the winter months when the Ice road is in operation. Our excitement spiked once we heard about the new highway. 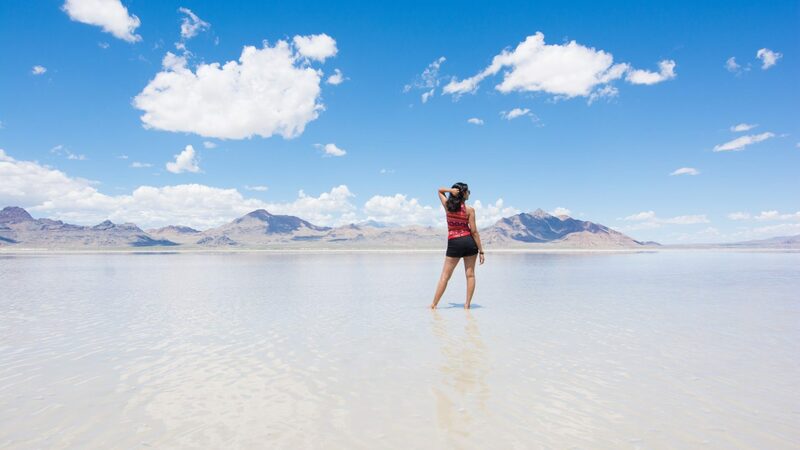 Immediately, we started to plan and prepare for this epic roadtrip. Even after all the perfect preparation, many things did not go as per plan. 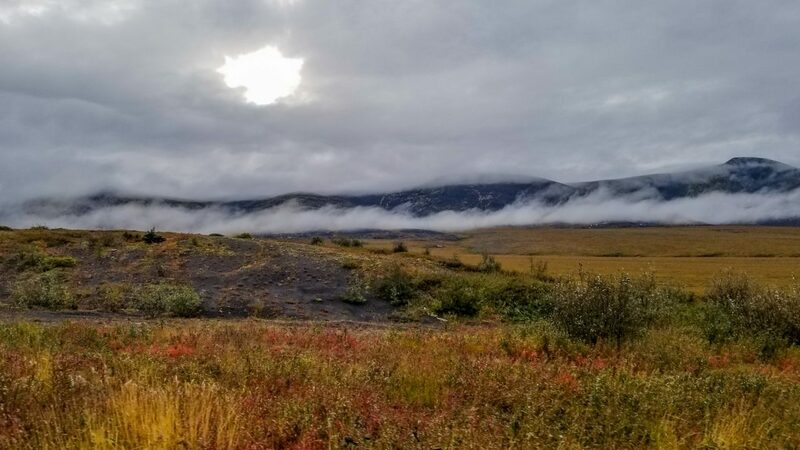 In this blog, we would like to share with you about our whole experience of driving on the Dempster highway to reach Arctic Ocean. 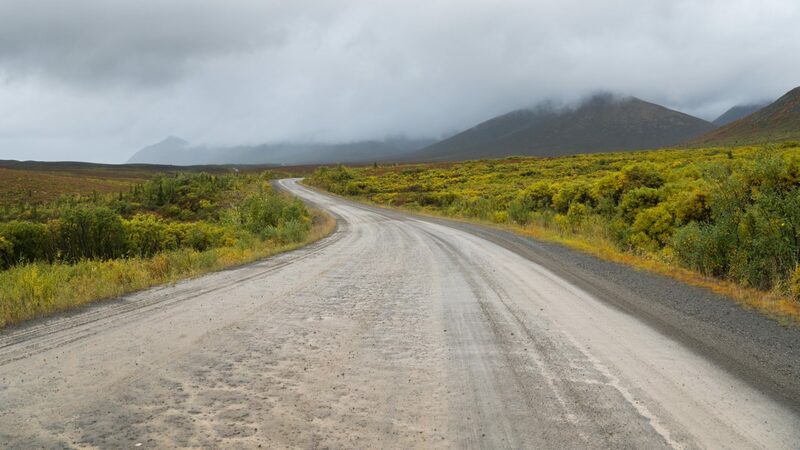 Just like Dalton, we knew that driving on the Dempster highway will be very challenging. 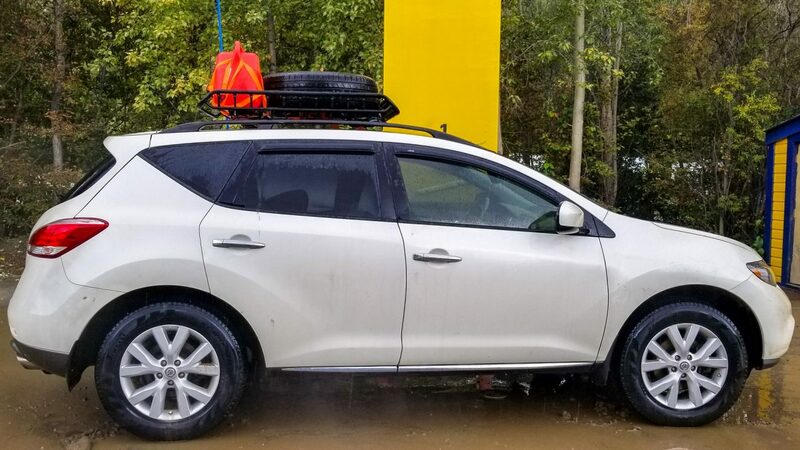 So, we decided to leave our camper trailer back at Dawson city to avoid any kind of risks. It is always a good idea to get information about the road conditions before heading out. 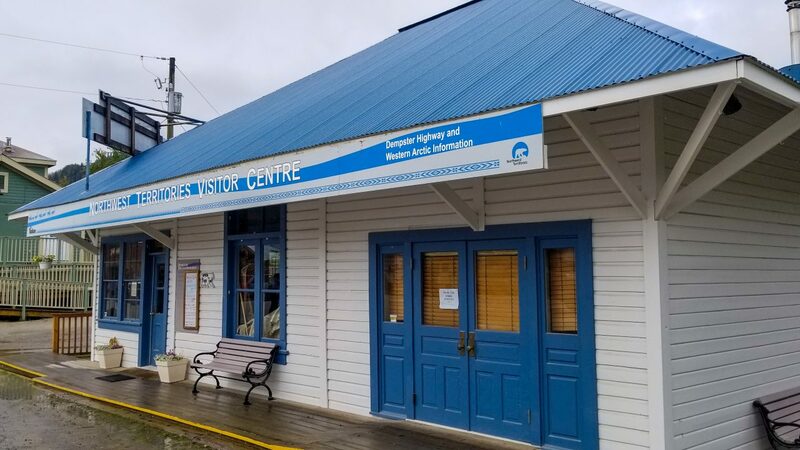 So, we stopped at the NorthWest Territories visitor center at Dawson city. But, we were not ready for the disappointment that lay ahead. 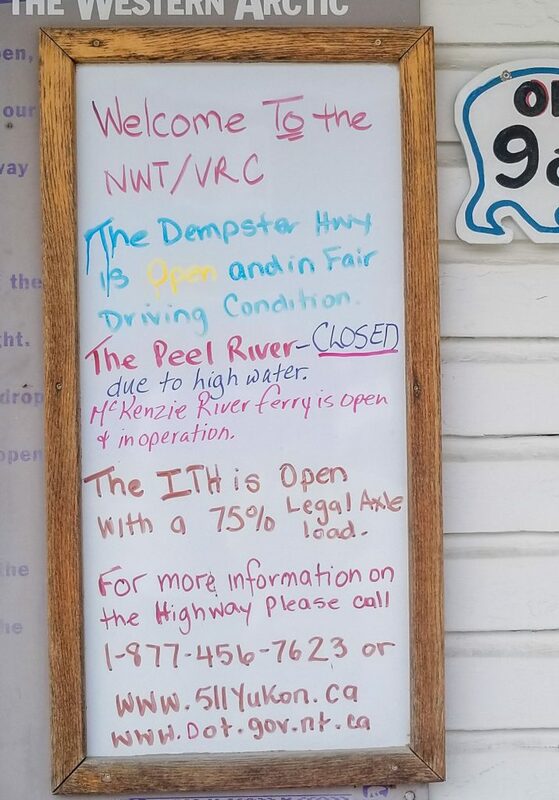 The information board (pic below) in front of the Visitor center said the Peel River ferry crossing was closed due to high water level. Officials there couldn’t confirm when the ferry will re-open. The weather forecast was also disappointing as it predicted chances of rain for next few days. We were struck with dilemma and crashing hopes. We were 3500 miles from our home and the Arctic was merely 500 miles more. It seemed like nature was preventing us from reaching our final destination. As a matter of fact, our first hurdle was the wild fire which closed down the Alaska Highway for over 24 hours. 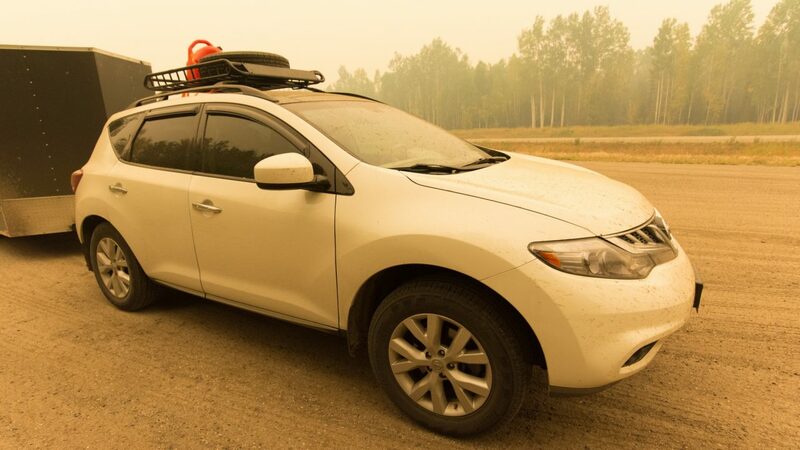 There was a sudden outbreak of wildfire at 6 different locations on the way to Watson lake. 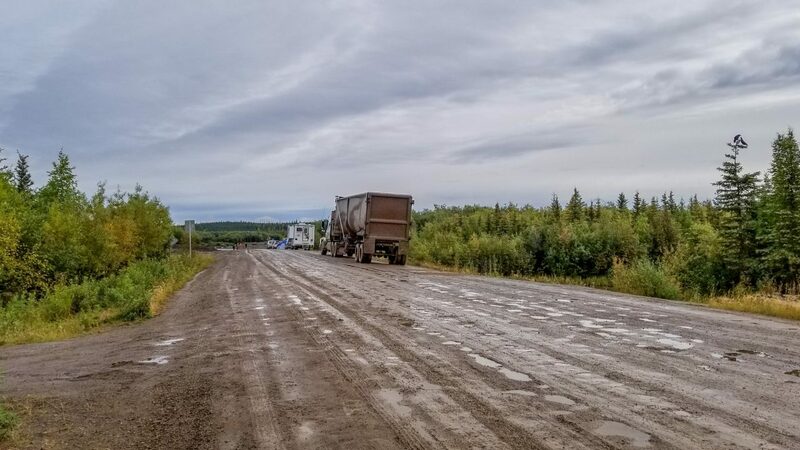 The road was blocked about 35 Miles from Liard provincial park and we had to wait for more than 24 hours with unbreathable air filled with smoke and ashes. It was a very bizarre experience and looked straight out of a post apocalyptic movie. People queued up in their vehicles with no clue of what really happened and when the highway will eventually open. 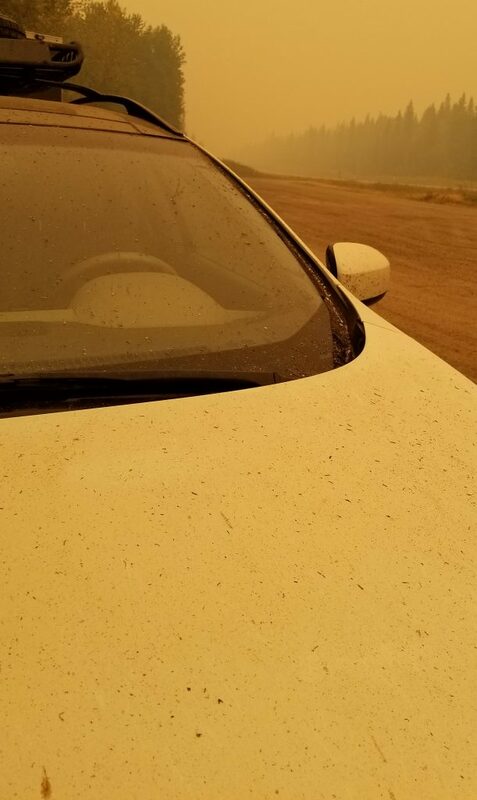 The thick smoke around us made it impossible to see the sky or the sun or the moon or the road. 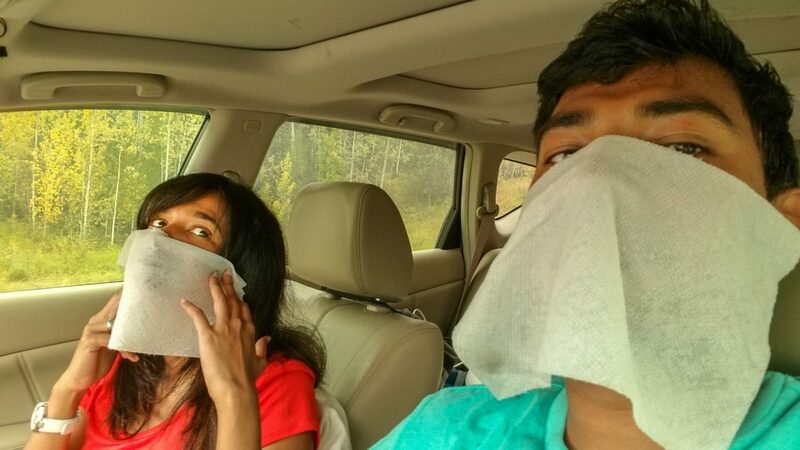 With tons of insects swarming, it was difficult staying either inside or outside of the car. Later the road was open and after driving about 50 miles we crossed the source of wildfire that was still burning. The atmosphere was not yellow or foggy as we experienced the prior day at Coal River. The heavy winds pushed the smoke and ash away 50 miles from the source. Later, we learned from news that the fires jumped highways and there were over 500 wildfires in BC and Yukon (third week of Aug, 2018). Should we take a chance or not? Coming back to our current situation at Dawson city, we were still on a dilemma. 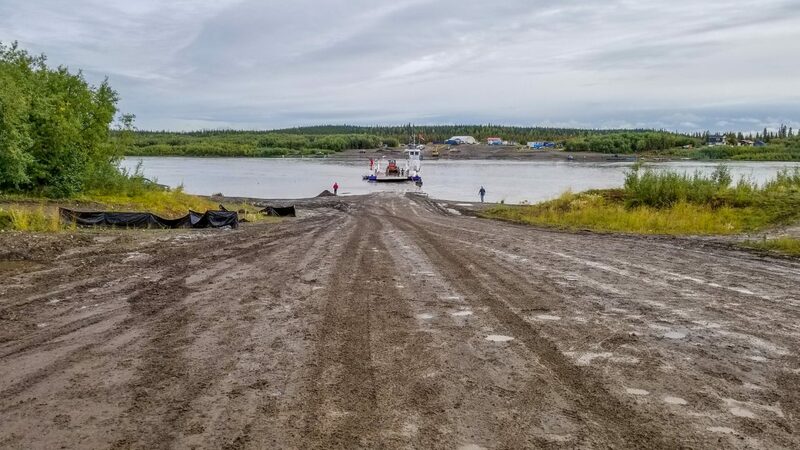 We have a confirmed hotel booking at Inuvik, but not knowing if the ferry will start operation we had no other choice than to cancel our booking. Peel river ferry crossing is about 570 km from Dawson. It being early afternoon already, we would reach Peel river only by next day. The status could change by the time we reach there. But there is no phone service in Dempster to track the status. Eagle plains, which is 400 kms from Dawson, is the only other source for information. Again there is no guarantee that ferry will be open soon. Should we go until there and return half way or wait until ferry opens?. We didn’t even have that much time left. We were already on a very tight schedule and need to return back to US before September 1st. Lots of questions, possibilities, considerations crawled into our minds. Though situations were favoring the impossibility, both of us had strong instincts telling us to make it no matter what. Finally, we made up our minds to take our chance. 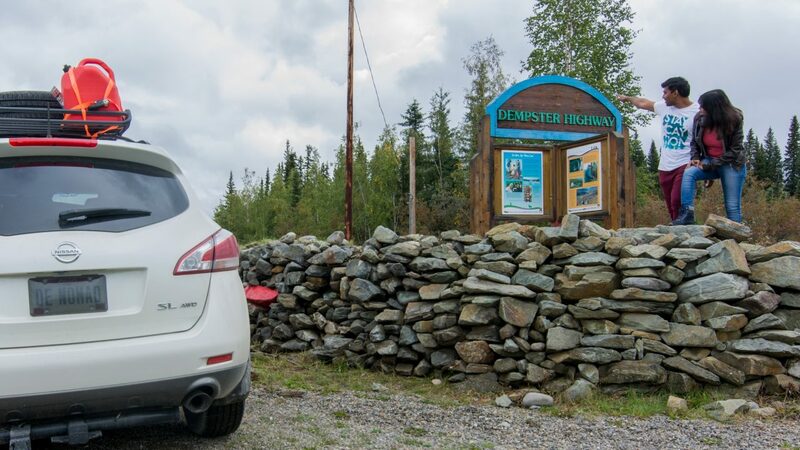 Start point is about 30 mins drive from Dawson city. 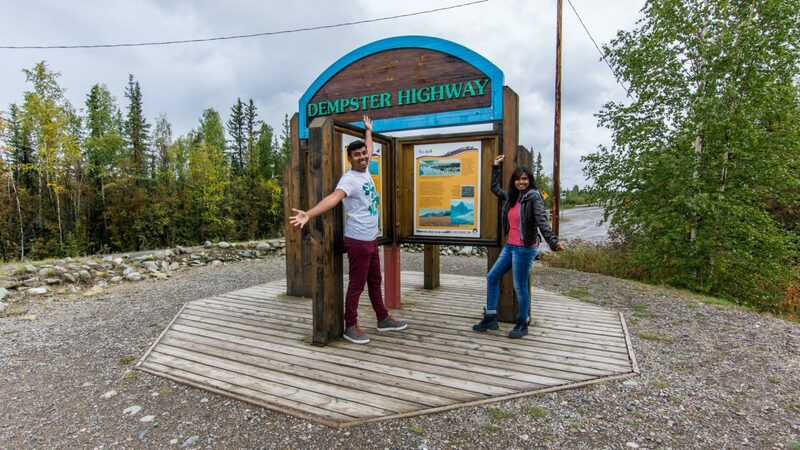 The road starts with the famous Dempster Highway Signboard in front with maps and information about Dempster and another wooden sign saying “Trans-canada trail”. 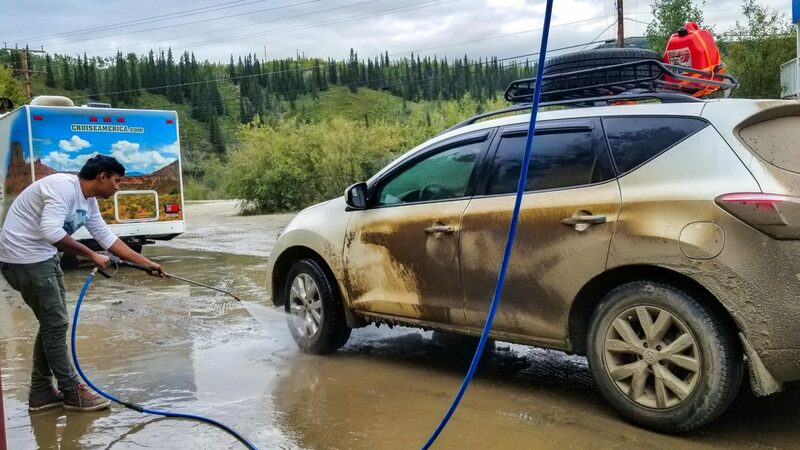 After all the photo ops infront of signs you will proceed to cross the Klondike river bridge. Before that, there were series of informational boards denoting the status of highway(open/closed). Like I said before, this highway is open only selective months. Some people unknowingly show up during the closed months. 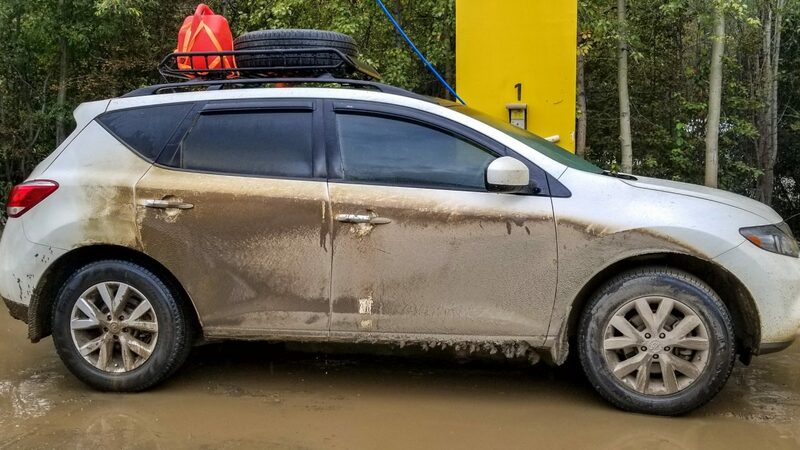 The rain had made the road worse and made it very difficult to navigate around the pot holes. These potholes were invisible from distance and will only show up when its already too late. We were only going 20 – 40 miles per hour. But having driven on Dalton before, we had a rough idea of what to expect. Atleast Dalton had paved road for 30% of the way. 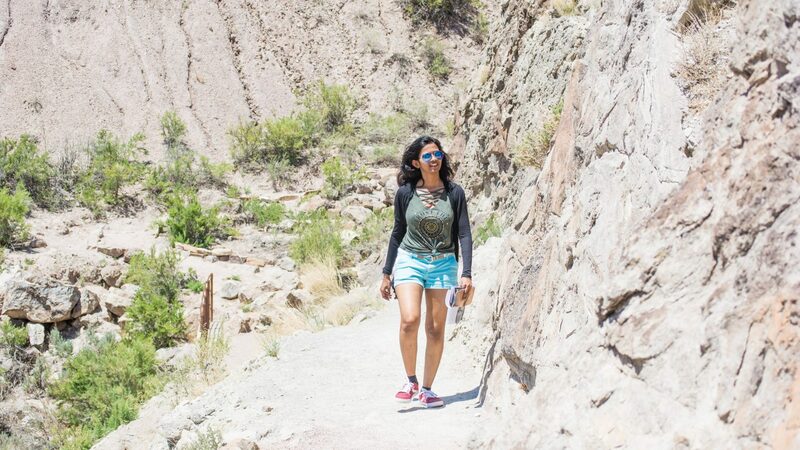 Gradually, the dense tall tree lines on either sides of the road transformed into low lines of colorful plants revealing the tall mountains behind. Suddenly we were surround by fall colors. It was so beautiful. We thought that we had picked right time to visit. We even caught ourselves saying “Damn, this drive is much more scenic than Dalton!”. 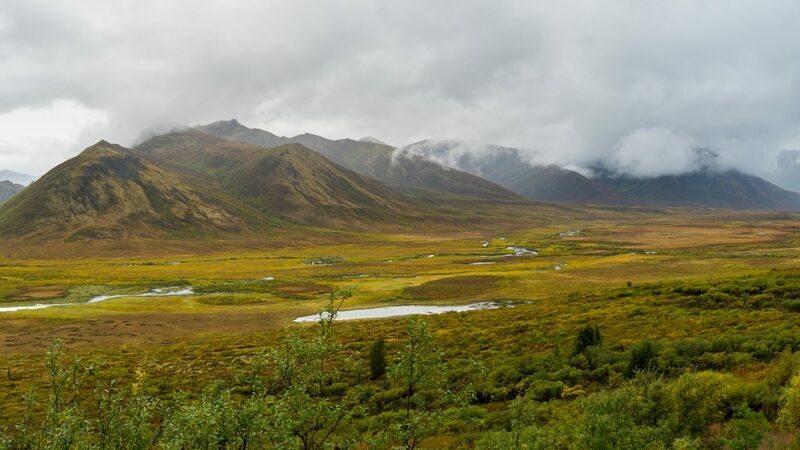 Soon you will reach Tombstone Park with visitor center on your left. It has outhouses, campground and many hiking/backpacking trails.We had our dinner (that we packed) here. 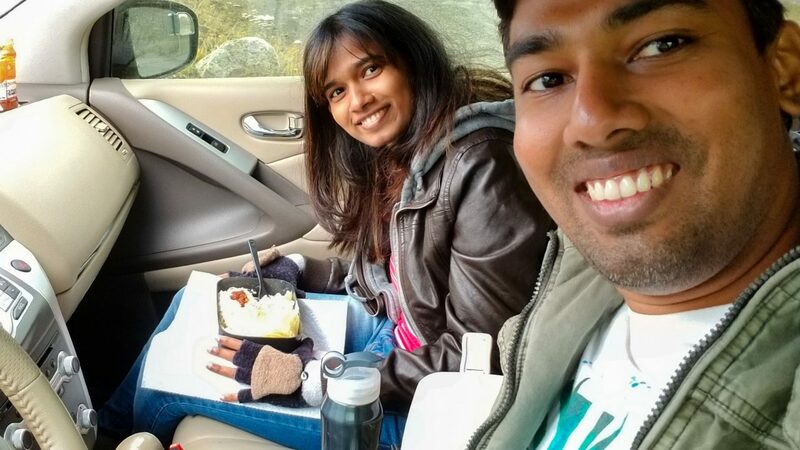 Curd rice and pickle tasted heavenly to us considering we din’t get a chance to have lunch and had a stressful day at visitor center to decide on this trip. Since we were on a tight schedule to reach Arctic, we said “see you soon” to this park and left. We reached eagle plains very late that night. The complex has a gas station, hotel, restaurant and shop for minor repairs. A huge parking lot in front where many work vehicles and trucks were parked. We had initially thought of asking people here about the ferry status. But since it was very late, we decided to keep driving. Also there was no phone signal in this area to check the status ourselves. 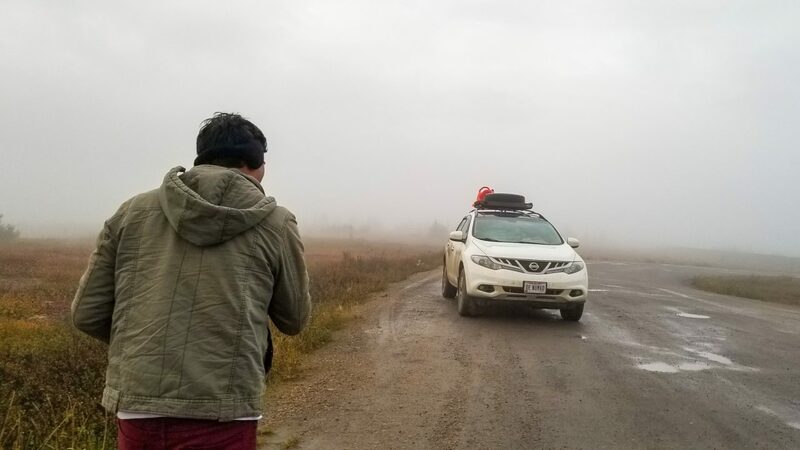 Unable to see the road due to heavy fog and without witnessing even one vehicle for over 2 hours, we crawled slowly towards Arctic Circle. On finally reaching the turnout, we were not able to see the Arctic Circle sign board. Also, can’t cross Arctic circle without experiencing it in daylight. So decided to halt here for the night. 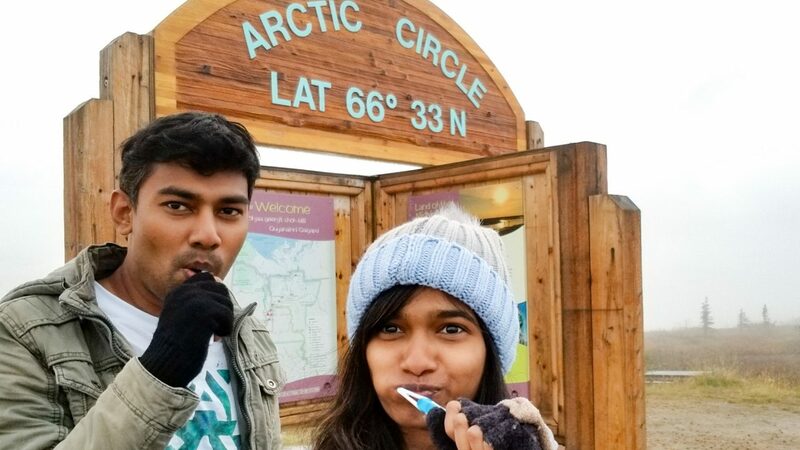 It was an amazing and exciting morning for us to wake up in front of the Arctic circle sign. It was just few feet away from where we car camped. 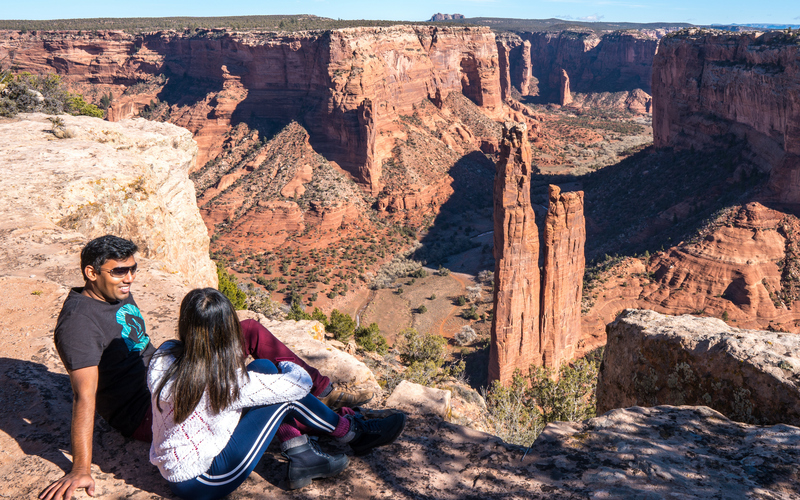 With each turn and each mile, the views became more and more breathtaking. Couldn’t get enough of it. 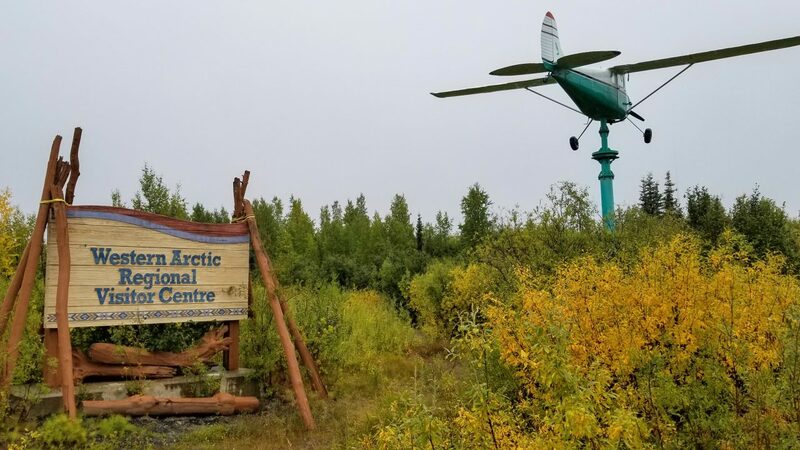 After crossing the Peel river, there is the Nitainlaii Territorial Park interpretive center where you can get your Arctic circle crossing certificate. It has campsites and shower too. Fort McPherson is few miles away from here. If you need gas, then this is your stop. This is the next ferry crossing. Its quite bigger than the previous ferry and can carry more vehicles. This ferry also stops at another community called “Tsiigehtchic”. 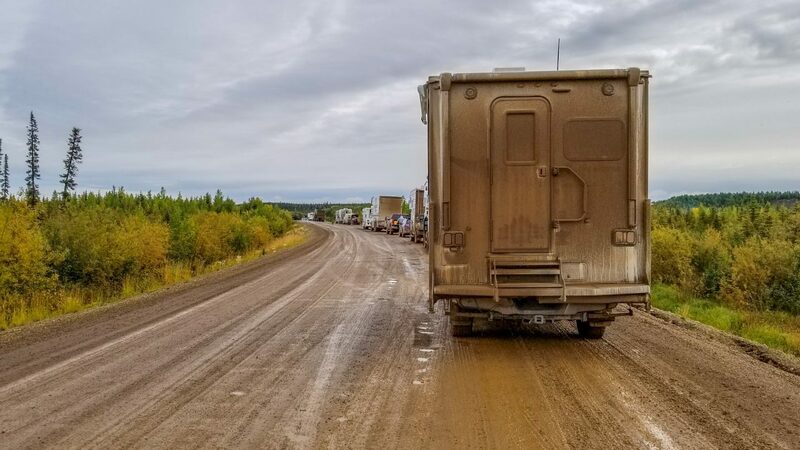 This is the last leg in Dempster highway. A colorful, calm and pleasant Arctic settlement called Inuvik. We reached this town late evening on our Day -2 of the Roadtrip. 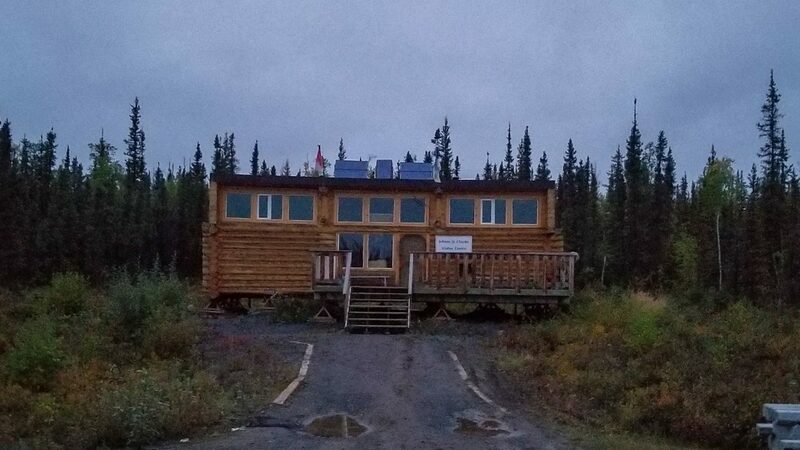 Stayed here for the night, tried their local food, met other travelers, toured their streets, landmarks and then headed to our next destination “Tuktoyaktuk”. 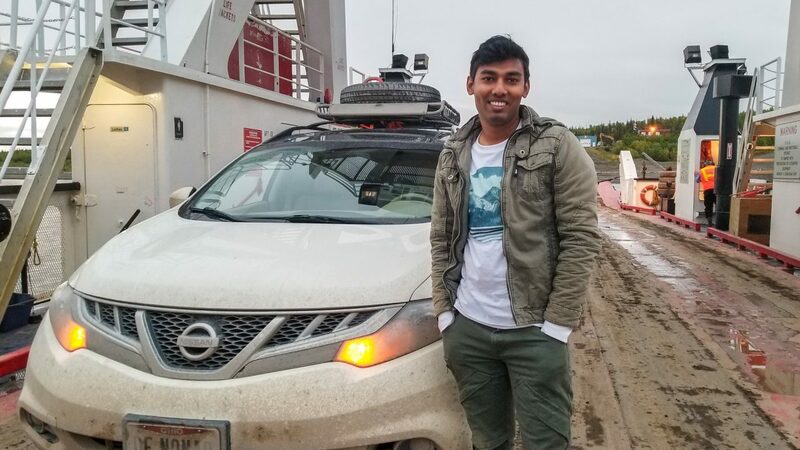 You can read about all of them in our blogs about Inuvik and experience of reaching Arctic Ocean at Tuk. 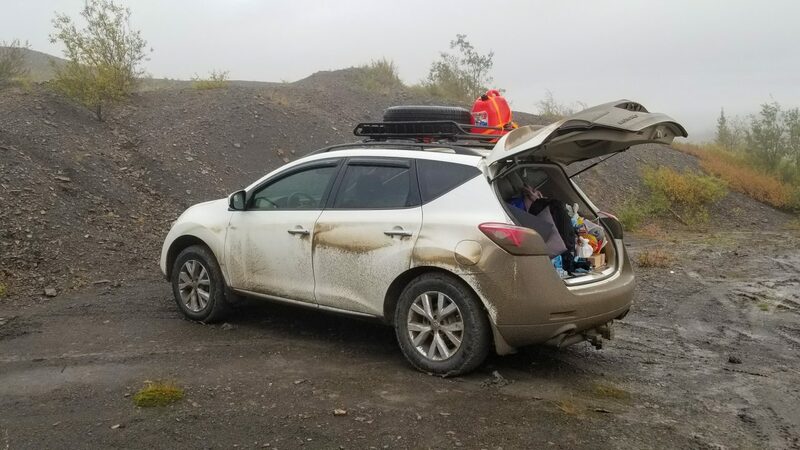 After having so much fun in Tuk, we returned to Inuvik to check off “having Reindeer Chili” from our list and then our return journey started. 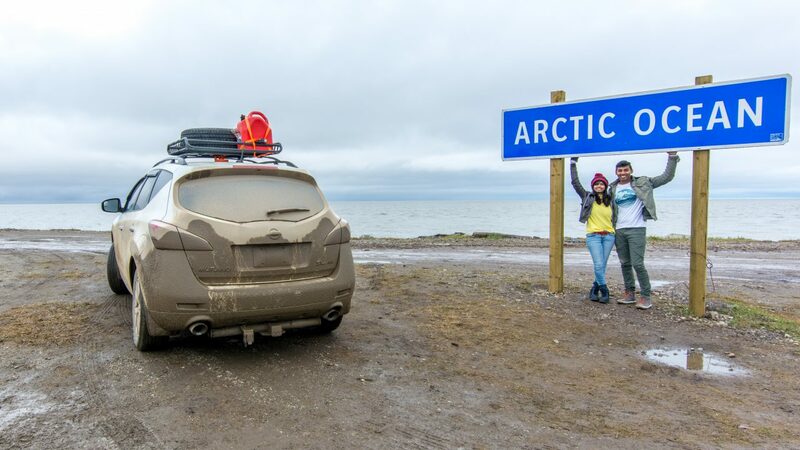 We were on our Day -3 (late evening) driving through the Arctic rejoicing last two days and couldn’t believe that we made it to Arctic Ocean overcoming the obstacles and on our way back already. The same night we crossed the two ferrys and boondocked at the Arctic circle turnoff again. We were the last ones to cross the Peel river for the night. 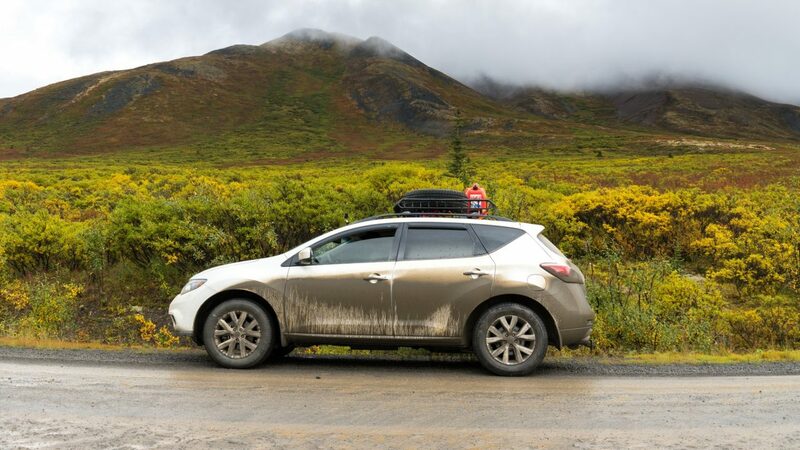 Our last three days have been very adventurous, scenic and lot fun driving through the colorful tundra wilderness. 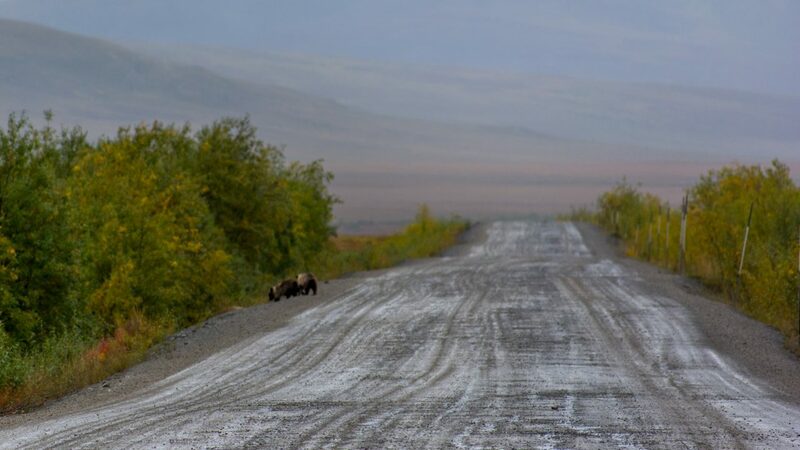 We encountered bears, foxes, rabbits and caribou. Stopped at every spot we felt was incredible beautiful (it was many!!) and absorbed the lovely nature. 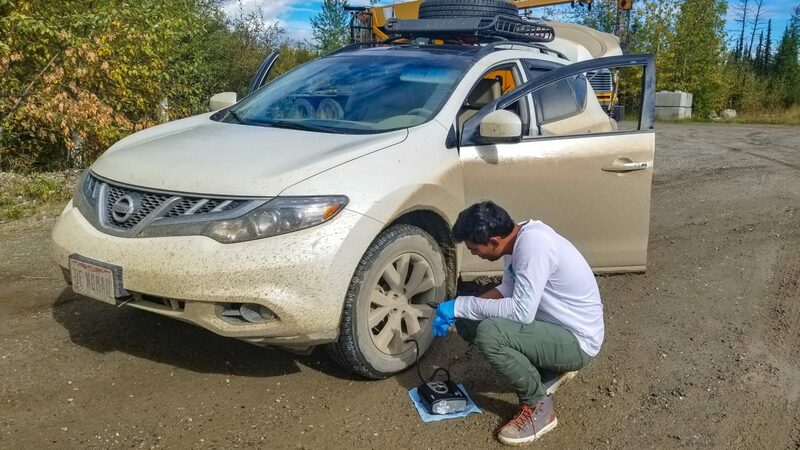 We also lower our tire pressure from 35 psi to around 25 psi when we are about to drive on rough / gravel road. This makes the ride comfortable and reduces the risk of tire blowout. This route doesn’t have much trucks like in Dalton. So, its should be a little relief. Be courteous on the road. Slow down while passing vehicles. Be safe and don’t forget to enjoy the beautiful nature. Happy travels!